Praying The Rosary For Peace! Aid To The Church In Need (ACN) is issuing an open invitation to children and families around the world to participate in an extraordinary event taking place on Thursday 18th October 2018: One Million Children Praying the Rosary…and at St. Joseph’s Catholic Primary School we are pleased to accept this wonderful invitation. What is this prayer campaign about and when was it started? The idea for the campaign came about in 2005 in Caracas, the capital of Venezuela. While a number of children were praying the rosary at a wayside shrine, several of the women in attendance strongly felt the presence of the Virgin Mary. They immediately thought of Saint Padre Pio’s promise: “When one million children pray the rosary, the world will change.” And that is exactly what this is all about: having faith in the power of children’s prayers. Why the 18th of October? October is traditionally the month of the rosary; the 18th is the feast day of Saint Luke the Evangelist. He has handed on to us the story of Jesus’s childhood and, according to tradition, is said to have been close to Our Lady, the Mother of God. How many children are taking part? Materials for the prayer campaign are available in 25 languages, including, for example, Arabic and the West African Hausa language. Children from around 80 countries and on all continents are taking part. It is truly a campaign of the World Church! Children and the rosary: this is not an easy connection to make for the Churches in the West. How do we get young people excited about these prayers? It is actually the other way around: children are far more open to the rosary than a lot of adults. When the rosary is prayed correctly and under proper guidance, it reveals a view of the Virgin Mary, one that grows more intimate the longer you pray the rosary. And getting this intimate view of Our Lady is something that we can learn from the children! 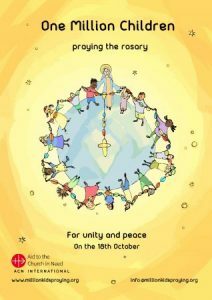 So, tomorrow our Chaplaincy Team will lead the rest of the school in this wonderful initiative as we pray the rosary for peace together. If your child has a set of rosary beads at home, please let them bring them to school tomorrow so that they can join in as fully as possible. Remember, you to can share in the power of praying the rosary with your children at home using the materials provided by Ten Ten which are available by clicking the link below. This entry was posted in General, General News, Special Celebrations. Bookmark the permalink.